A major bank job is being planned and you'll need to get in on the action. Click here to play! 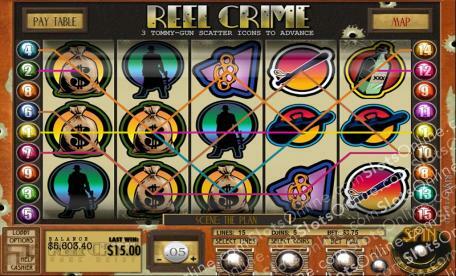 If you can successfully pull off the bank heist, you'll be rolling in the dough! Stage 1: Your main goal is to spin the Tommy guns in order to get through to the next stage of the plan. Spin three or more of these guns anywhere on the board to advance and trigger a bonus round to help you bring in more wins. Stage 2: You'll need to pick the lock on the vault to collect the cash. In order to do this spin three or more bank vaults nine times to pick the lock and proceed. Watch out though because a police officer has been added to the reels. Spin three or more of these guys too many times and you'll be caught and sent back to the beginning of the game. Stage 3: With the cash in hand, you'll need to pull off the big getaway. Spin three or more getaway symbols to accomplish this. This round is also filled with bonuses and scatters, including the dynamite. Spin two or more to trigger a number of free spins. Again, you'll have to watch out for the policeman. Spin three or more and you'll get caught! There are plenty of other symbols throughout to help you bring in some cash, including moonshine, batons, hats, shoes, brass knuckles, cash bags and violin cases. Can you pull of the bank heist? If you're successful, you'll bring in plenty of major cash winnings! There are a few different scatter symbols in this game, based on which stage you're at. These include the Tommy gun, the bank vault, the getaway, dynamite and the police man. Spin three or more of the first three symbols in their respective stages and you will advance to the next stage and trigger a bonus round. Two or more of the dynamite symbol in Stage 3 will get your a number of free spins in which prizes are multiplied. Spin the police man from Stage 2 on and you will be caught and sent back to the beginning of the game. There are a few different bonus rounds in this game, depending on which stage you are at. These rounds are triggered by symbols such as the Tommy Gun, the bank valut or the getaway symbol. Spin three or more and you will activate a bonus game in which you will have to perform a task to advance to the next stage and win a number of free coins.